In which we are urged to get out from behind our desks and go TO our clients to earn their business. My last Peru story… At least for a while.. 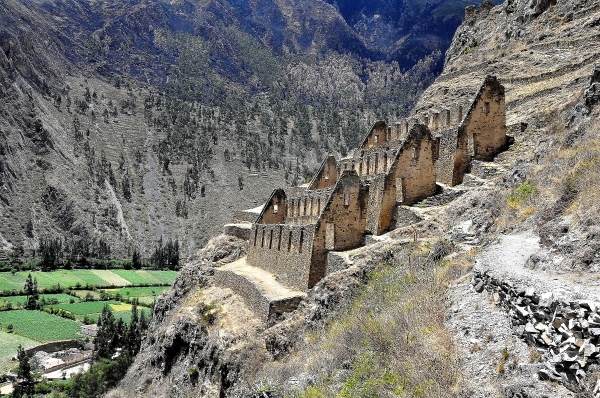 The village of Ollantaytambo lies in the Urumbamba Valley about 60 kilometers from Cusco, 9,000 feet above sea level, along the Patakancha River. On one side of the village, the Temple of the Sun rises many terraces above the valley floor. On the opposing side, perched several hundred feet above, lie the ruins of the granaries, buildings in which the Quechua stored grain and other food. Valley winds dried and cooled the stored food, prolonging its storage life. Planning our day over breakfast, we decided to begin with the granaries. The roughly one-hour climb is challenging, particularly as one is adjusting to altitude, switching back and forth across the face of a steep incline. To reach the trail head, we walked 20 minutes from the train station through the town Square, out the back side and through a significant portion of the old village. A few minutes into our ascent, feeling the first twinges of burning thighs and gasping for breath, we shifted a little to step by a man sitting on a large rock on the uphill side of the trail. Speaking first in English and then in Spanish, when he discovered that two of us were fluent, he asked, “Would you like a guide?” He went on to say that is from the village, an experienced guide. We said, “No, thank you,” being careful of strangers and all that. But he continued, gently and quietly, describing the stories that he could tell and, long story short, he won us over. He guided us through that day and the next, including a van and driver to take us to the spots that he recommended. It wasn’t until we met Juan Carlos at his carefully chosen turn in the trail, away from the desks and signs and milling noise in the square, that we reconsidered. By all accounts, it was the right decision. I admired his approach. A classic “professional services” sale – in the field, at the point of need, face-to-face, demonstrating by example what he could offer – that earned him a grateful two-day client.